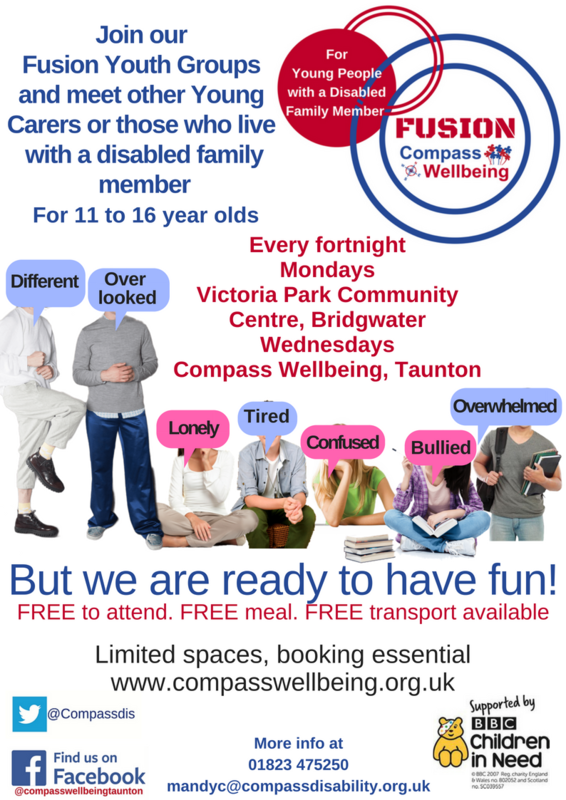 Fusion Youth Groups are for young people aged 11 to 16 living in Sedgemoor and Taunton Deane whose lives are impacted by caring for a parent or other family member who is ill, disabled or misuses drugs or alcohol. A Fusion youngster may also be someone who has no specific carers responsibilities but whose lives are impacted by living with a sibling who has a disability, long term health condition or learning impairment. These youngsters may have more responsibility than other youngsters due to their caring responsibilities or they may have less opportunities to enjoy their childhood due to their parents’ or carer’s commitments to a disabled sibling or other family member. Many young carers struggle to juggle their education and caring, which can cause pressure and stress. Many say that nobody in their school is aware of their caring role. Some have been bullied at school because of their caring role. Some miss school because of their caring role. But young people can learn lots of useful skills by being a young carer. Fusion Youngsters can grow and seek reassurance and understanding from others in a similar situation to them. What do Fusion youngsters do? When and where do Fusion Youngsters meet? Fusion Groups are funded by BBC Children in Need and are completely free to attend. Youngsters enjoy a free meal, free activities and free outings. Youngsters occasionally engage in fundraising activities to fund more outings or to purchase equipment that they may want. The ability for a Fusion youngster to attend may be affected if they persistently book a place but fail to attend without notifying us. BBC Children in Need have agreed to fund transport for Fusion youngsters living in Taunton Deane or Sedgemoor to attend their local group if they have no other means of attending. We welcome a parent or responsible adult to attend on the Fusion youngsters first session so that they can be registered and we can learn a little more about them and their situation. If this is not possible then we can arrange to visit a parent at home or a location close by or can contact you by telephone. We aim to improve Fusion youngsters’ confidence, social interaction and independence but we understand that some youngsters may want to be accompanied. This may only be for a few weeks whilst they grow in confidence and we encourage parents and carers to withdraw gradually at a pace that suits your youngster, after all you know them best.